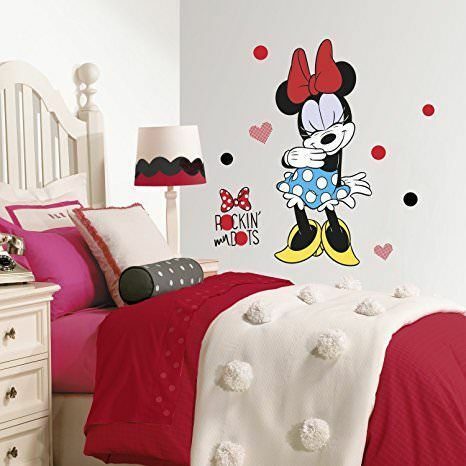 It’s all about the dots in Minnie Rocks The Dots Giant Wall Decals. Celebrate style and confidence with the one and only, Minnie Mouse! Embodying a constant reminder to girls of all ages to confidently express themselves, a fresh design interpretation of the First Lady of Disney is featured in this unique giant Disney wall decal. Start styling your wall in seconds! Fourteen wall decals created with a unique, iconic color palette assemble in seconds. Just peel and stick. Then watch your giant-sized Minnie Mouse quickly form on the wall! Use additional hearts, bows, dots and phrases to decorate around Minnie or spread the theme throughout a room and stick on furniture, headboards, doors, lamps and more.